Sterling Silver 1.5mm Flat Cable Jewelry Chain in bulk footage spools or by the inch. 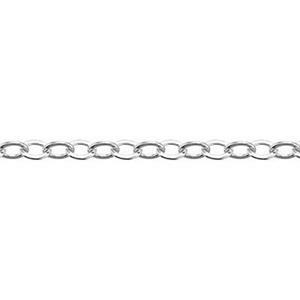 A flat open cable chain with wide open oval links so you can easily add in links or charms. The 1.5mm diameter allows for medium weight pendants without stretching. Flat links catch the light and give you a big look at a great price. A great choice for all kinds of jewelry design ideas.